The week in iPhone cases: Novelties galore! Say what you will about iOS's "shake to undo" feature, but this official Etch A Sketch iPad case gives it an entirely new meaning. 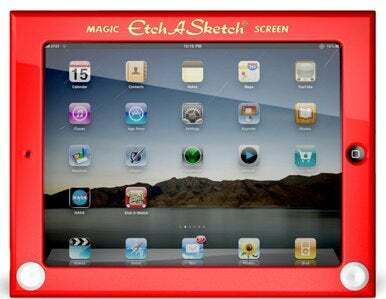 Created by Headcase and officially licensed by Ohio Art, makers of the original Etch A Sketch, this $39 iPad case is sure to elicit nostalgic feelings from those who spent hours of their youth interacting with a certain magical tablet that doesn't offer high speed internet access or a touchscreen interface. Released as part of the Etch A Sketch's fiftieth anniversary, the case is made of impact-resistant plastic and has rubber feet to keep your iPad stable on a flat surface. It also allows access to all of your iPad's switches, ports, and buttons, and retractable kickstands allow you to either lay your iPad flat, or angle it for easy use with a Bluetooth keyboard. But the biggest reason to buy it is for the amusing looks and comments you'll undoubtedly receive when you use your Etch A Sketched-out iPad in public.